I know, I know. It’s October. But when I emailed Irish hotels asking about their Christmas residential packages, some were already sold out. “We sold our last room yesterday,” Mount Juliet told me — despite a couple’s rate of almost €1,500 for three nights. Sounds crazy? Maybe, but staying in a hotel at Christmas not only frees you from the cooking and wash-up. It allows groups to get together without getting under each other’s skin, and rates include most meals and trimmings ranging from Santa visits to log fires, classic movies, mulled wine and music... all staffed by people paid overtime and holiday rates. By now, many of the hotels listed have Christmas down to a fine art. Here’s a sample of their best offers, based on three-night stays. €595pp: Skip the stress with a chill-out in Cavan, thanks to Farnham Estate Resort’s bracing walks, log fires and spa treatments. 049 437-7700; farnhamestate.ie. €850pp: Fancy a super-cosy Christmas in Connemara? Ballynahinch Castle has a three-day deal from €850pp, while Cashel House costs from €695pp. ballynahinch-castle.com; cashelhouse.ie. €950pp: Flourishes on Glenlo Abbey’s three-night Galway programme include a falconry show, and Santa for kids. 091 519600; glenloabbeyhotel.ie. €1,255pp: The Blue Book’s Hayfield Manor (pictured) has the ultimate Cork Christmas over three days, including a seasonal afternoon tea. 021 484-5900; hayfieldmanor.ie; irelands-blue-book.ie. €1,495pp: The Brennan brothers do a great Christmas in their Park Hotel in Kenmare, complete with candlelit dinners and walks. 064 664-1200; parkkenmare.com. €2,348pp: Seeking ‘A Christmas beyond everything’? 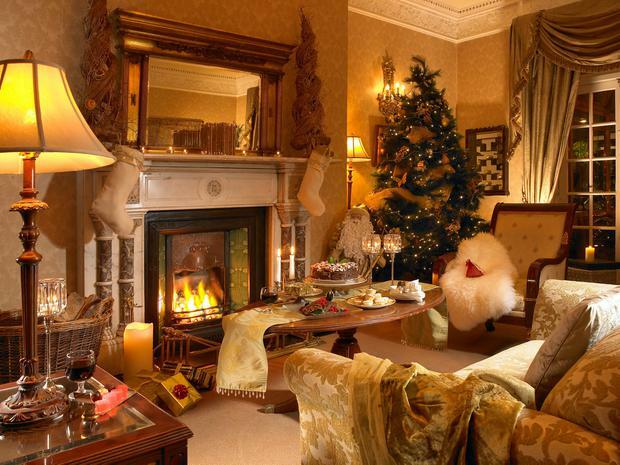 Adare Manor re-opens on November 2, and its three-night Christmas package spares no expense. 061 396204; adaremanor.com. €180pp: Dublin’s Portmarnock Hotel & Golf Links has overnight rates over the Christmas period... neat option if there’s no room at the Inn? portmarnock.com. €275pp: The Green Isle Hotel has B&B, Christmas dinner and more over a one-night stay. Two and three-night packages are also available. greenislehotel.com. €325pp: Limerick’s Strand Hotel (above) has a two-night residential package, children go free, and it’s just a stone’s throw from the city centre. strandlimerick.ie. €399pp: Wicklow’s Glenview Hotel has two-night deals overlooking the Glen of the Downs... you can check-in from noon on Christmas Eve. glenviewhotel.com. NB: Packages subject to availability. Food and entertainment offerings, as well as children’s rates, may differ across hotels. Make sure you compare like with like for your needs before committing!